A local boy has made it his mission to spread awareness for organ donation, and promote it in the municipality in honour of one of the Humboldt Broncos players. Twelve-year-old Ethan Bos made a presentation to the Municipal Council last Tuesday evening, asking them to declare April 7 as Green Shirt Day in the municipality. Green Shirt Day is a movement that began this year in honour of the Logan Boulet effect. Logan was one of the 16 passengers who died in the devastating bus crash on April 6, 2018. He had recently signed up to become and organ donor and, because of this, was able to save six lives. When word got out about the heroism of Logan’s choice to become an organ donor, it inspired over 100,000 people to register in the days and weeks that followed. According to the Green Shirt Day website, this is the is the largest number of Canadians to register as organ donors in history based on a single person or event. 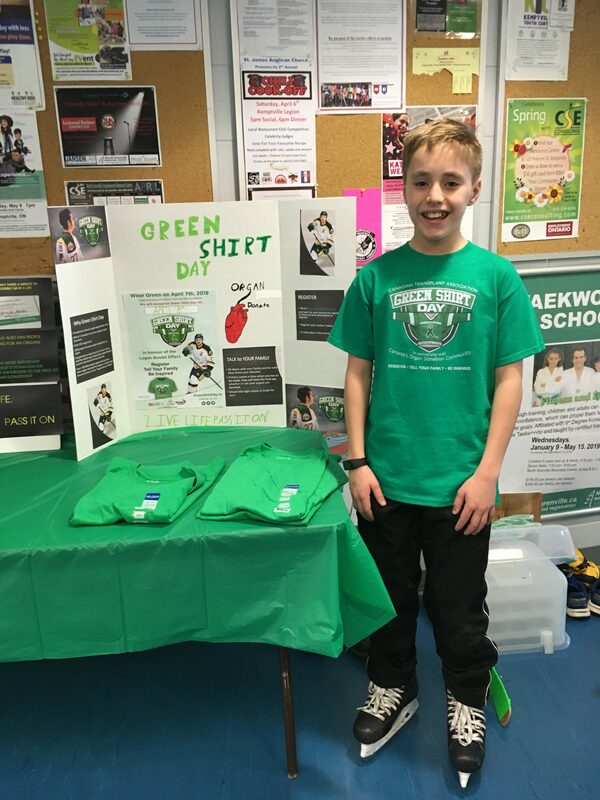 Ethan’s first goal was to bring Green Shirt Day to St. Michael Catholic High School, where he is currently a Grade 7 student. When his teacher heard what he was trying to do, she encouraged him make a presentation to Council, requesting that they bring Green Shirt Day to the whole municipality. Logan put together a PowerPoint presentation outlining Logan’s story and the need for organ donors in this country. “Two hundred people die every year waiting [for a transplant],” he says. Although council was not able to make a declaration for this year (as it was a Committee of the Whole meeting, not a regular Council meeting where resolutions are passed), all members of council expressed their support for what Ethan is doing and requested that he return next year to bring it to the attention of council once again. Ethan has also attracted attention from MPP for the area, Steve Clark, who had a conversation with him over Facetime last Thursday to discuss bringing Green Shirt Day province-wide. “It’s done a lot better than I originally planned,” Ethan said. To commemorate the day, Ethan and his family were able to organize a free skate at the Municipal Centre on Sunday. Everyone was invited to come out, wear a green shirt and skate in Logan’s honour. This is following in the footsteps of the citizens of Lethbridge, Alberta (Logan’s home town) who also held a free skate on Sunday in honour of Logan and Green Shirt Day. Ethan hopes that his message, and Green Shirt Day, will resonate with the residents of North Grenville and more people will register to become organ donors as a result. His goal is to increase the number of donors in the municipality by 30 per cent. “Live life. Pass it on.” he says. Previous articleThe Jivewires are Coming! Bravo Ethan! Registering to be an organ and tissue donor takes less than 2 minutes @www.beadonor.ca and it’s the right thing to do!